The pre-tribulation Rapture position creates TWO comings within a single coming. Believers are told to expectantly await each of these TWO comings. And, these comings are accompanied by TWO shouts, TWO trumps, TWO resurrections of TWO elects, and TWO reward ceremonies following TWO celestial signs. Thus there are TWO beginnings to the Day of the Lord. All of this doubling is unnecessary and unscriptural. Is it any wonder that churches don't understand the book of Revelation? The pre-tribulation Rapture position takes the simple teaching of scripture and complicates it beyond all recognition. The single event of the Second Coming is chopped up and spread out over a seven-year period. 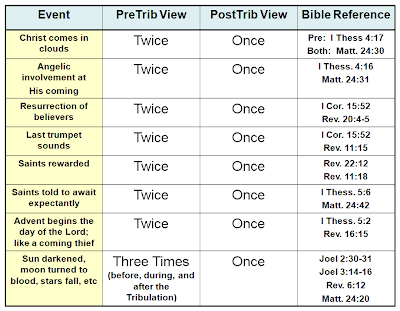 In the fourth column of the above chart, you will find a list of bible references. 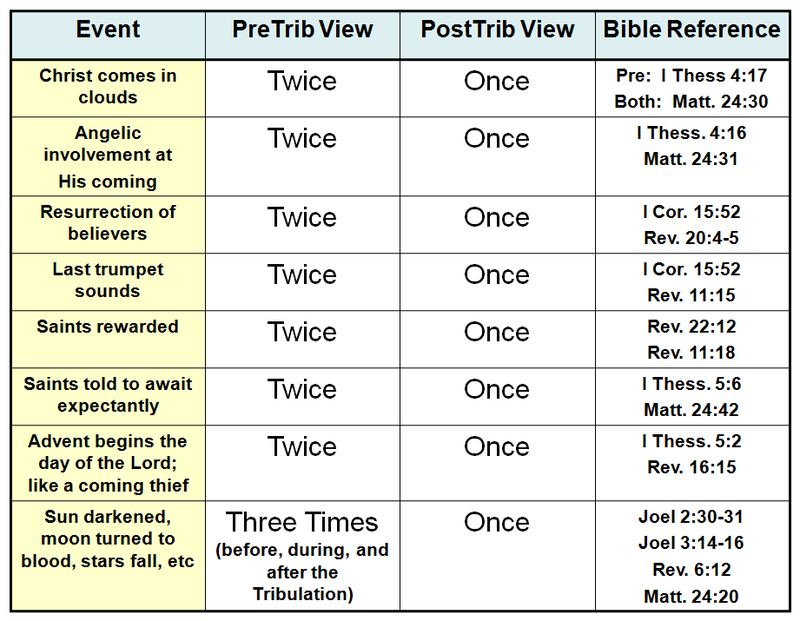 The top reference is usually associated with the pre-tribulation Rapture, the bottom reference is normally associated with the visible Second Advent. The pre-tribulation Rapture has Christ coming in the clouds TWICE. His coming is with angels TWICE. Has a resurrection of believers TWICE. His coming is with the sound of a trumpet TWICE. Saints are told to wait expectantly TWICE. And, the sun is darkened, the moon is turned into blood, and the stars fall THREE times! This is like saying that because there are FOUR Gospels, there are four Messiahs! The pre-trib view creates TWO elects, TWO covenant peoples of God -- the saved Jews of the Old Testament, and the saved Church of the New Testament. But these saved groups are not seen as equal. The pre-trib view elevates one of God’s covenant people (the Church who is made one with Christ) ABOVE the other of God’s covenant people (the OT Jewish believers who they say are not). And, to Paul’s list of “Jews,… Gentiles, [and] the church of God” (I Cor. 10:32), those who teach a pre-tribulation Rapture must add a fourth category—the tribulation saint. This is a grievous and illogical error. Let's not stray from the simplicity which is in Christ. The Rapture is AT the Revelation. All of these events happen one time. And, the book of Revelation just got a whole lot easier to understand!